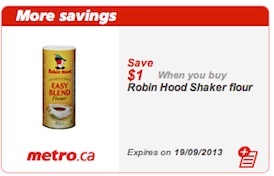 Robin Hood Coupon is a printable coupon available at Metro. Visit Metro only and click on their coupons. Select the Robin Hood coupon, print it off at home and bring it into any Metro stores. 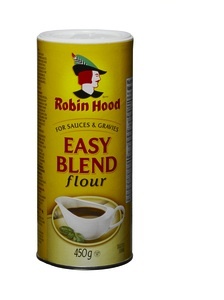 Robin Hood coupon is to save $1 on any Robin Hood Shaker Flour. Robin Hood flour coupon is valid only in Metro stores across Canada. It expires Sept 19, 2013. Robin Hood shaker flour is available in any Metro stores. I found Robin Hood shaker at Walmart for $2.98, so if you find it at Metro for more than $3.98 then it would be a better deal to buy it at Walmart. Robin Hood® Best For Blending Flour is milled using a special process to provide you with a granular flour that blends easier into wet or dry ingredients with less dusting or clumping than regular flours. It can be used in any recipe that calls for all purpose flour and is an ideal thickening agent for sauces and gravies. Whenever your baking calls for all purpose flour, try Robin Hood® Best For Blending Flour instead.